It probably isn’t something that you feel the need to prove, but showing your organization how valuable you really are is a smart idea. Why? Because like every organization, your organization faces challenges in developing an agile CME management structure that can meet the diverse needs of a growing audience of learners. One of the most time and resource intensive components of CME management is collecting, warehousing, and analyzing program data. From course completion statistics to learner assessment data, having a clear portrait of the success (or failings) of your CME courses is key to the future success of your program. In this post, we’ll look at three ways that you can step in and be the analytics hero for your organization when it needs you the most. It goes without saying that your data is your greatest asset, but you might not know it can also be your most significant vulnerability when it comes to CME program development. That’s because accurate learner performance data support improved educational outcomes: flawed data can result in a curriculum that despite being designed for student success, it is doomed to encourage failure. Also, accurate data helps you define the parameters of your CME mission, allowing you to determine what your learners’ needs are at present and how you can fulfill them as their needs change over time. All of those great benefits, however, depend on how quickly you can access critical data—if it’s time-consuming and subject to lots of human errors (i.e., you’re doing it manually), then it will be a long time before you see the fruits of your labor as improved learner outcomes. In addition to access, you’ll need a tool to which can automate the transformation of raw data into actionable insights. That’s a tall order, but luckily, you don’t have to switch out your staff for a team of friendly data wrangling robots to get the job done. Customizable dashboards that instantly connect the dots between your data on course delivery and patterns in learner performance, providing valuable insights at a glance. Simplified reporting that allows you to create and easily share rich data snapshots that power on-point year-to-year benchmark analysis and achievement forecasts. Real-time and historical course data at your fingertips, allowing you to present time series analysis reports as easy-to-understand visualizations with a single click. 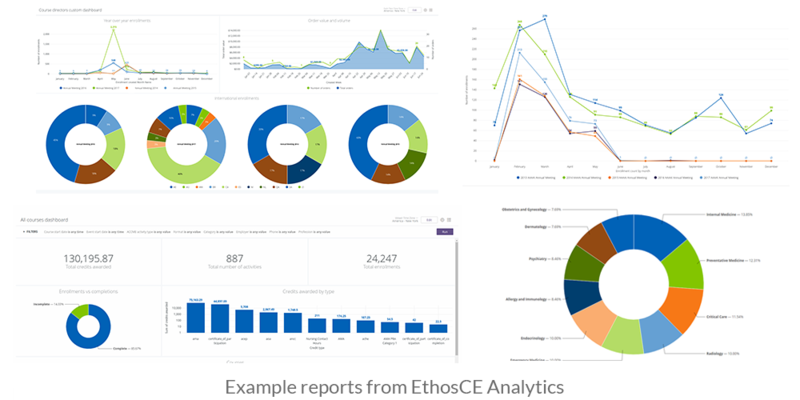 EthosCE Analysis, an analytics suite that is a standard component of the EthosCE CME management platform, includes all of the above, along with an enterprise-grade LMS. EthosCE Analysis makes discovering cause and effect relationships within data effortless, freeing you to focus on transforming insights into tangible course management improvements. Although it may sound like a tagline for a horror movie, a data gap really can be nightmarish for CME directors. A data gap is just what it looks like, a gap in the flow of critical data over time. It may be as simple as course enrollment information that is missing for a particular month, or a more complicated issue such as course completion rates that don’t match up with a tally of learner assessments. Just like a gap in a dam, missing data can compromise the entire structure of your course analysis, creating faulty performance predictions that fall apart under pressure (i.e., when it is time to compile the Self Study). If you’re attempting to find missing data in the ever-flowing stream of information that your program generates, then you’d better have a virtually endless supply of coffee and patience. Looking for missing data sets is going to take a very, very long time—even if you are going back just a few months. In the meantime, the most pressing issues with your CME program—such as learner performance—can’t be resolved until you get an accurate, data-driven snapshot of the scale of the problem. If you’ve chosen to go with an enterprise-grade SaaS, then you’ve saved yourself from the perils of the data gap. If you’ve chosen EthosCE, then you won’t even have to touch your data to ensure that it is complete and comprehensive from day one. EthosCE Analysis automates data collection and warehousing, empowering you by eliminating the gaps in the course and program information that you need to transform your curriculum and improve learner outcomes. Because EthosCE automates behavioral analytics on the learner side, you can focus on any “gaps” in manually derived, external data— such as information on non-participating association member perceptions of current CME programming or human resource management issues—which may contain crucial insights on factors impacting program success. The best news? You can even import external data into the EthosCE Analysis to get a bird’s eye view of how it relates to other metrics. 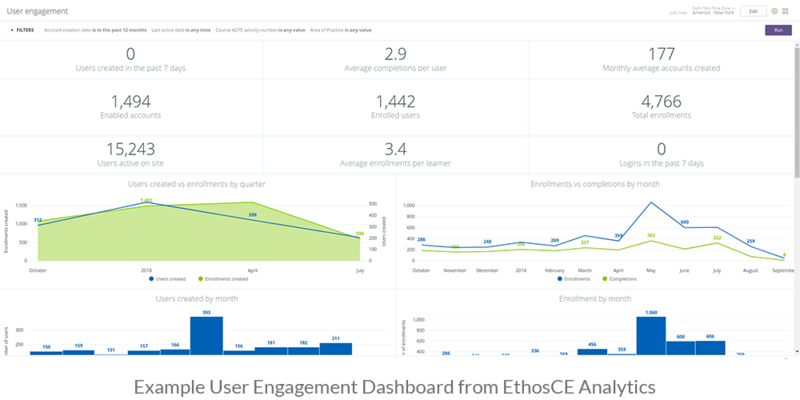 Since a snapshot of all critical program data is always available via the EthosCE Analysis dashboard, you can create an efficient process for retrieving and analyzing external data, and then placing it in the context of historical and real-time learner performance insights. That means and presenting a complete portrait of your program’s wins in the Self Study will be painless. Although it may appear simple, meeting those standards requires an enormous amount of time and significant expertise to present a Self Study that adequately represents your program’s strengths. The icing on the cake? The EthosCE platform also facilitates PARS-compliant report submissions. With EthosCE, CME directors have a full-suite of CME management tools—from a scalable, purpose-built LMS to enterprise-grade educational outcome analytics—in a single, user-friendly platform. It’s likely that your organization already knows how valuable you are, but it can’t hurt to let them know that you’re indispensable as well. If you’re ready to have one-click access to your program data and insights, connect with us to set up a demo. EthosCE is designed specially for medical CE, with over 16 years of experience in the field. We’ve helped many associations and universities make the switch to our easy-to-use LMS. If you’d like to learn more about how EthosCE may be the right LMS for you, feel free to request a free 1-on-1 walkthrough here with one of our medical CE experts. 3 LMS Course Management Ideas That Improve CME Activity Completion Enough is Enough! Getting a LMS that Works for You!